For years we've been using a cabinet blaster loaded with aluminum oxide to restore the looks of coil springs on old cars and vintage sports cars that come to our shop. Then, a few days ago the owner of a body shop who does body work for us came in while we were blasting some Triumph TR-250 coil springs. "You're media blasting coil springs?" he asked in a surprised tone. "Don't you know that you're not supposed to do that because the heat generated by the blasting process them takes the temper out of the spring steel." Obviously, we didn't know that and we weren't even sure his information was correct, but it sure seemed like he had hit upon a good topic for a technical article. 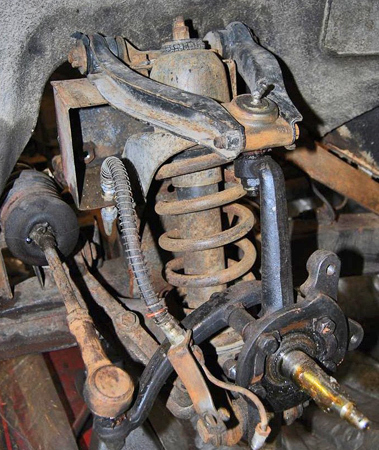 So, naturally, we hopped on the Internet and started trying to find out whether we had ruined our customer's springs (if we had, new TR250 coil springs are readily available from Moss Motors or Victoria British). 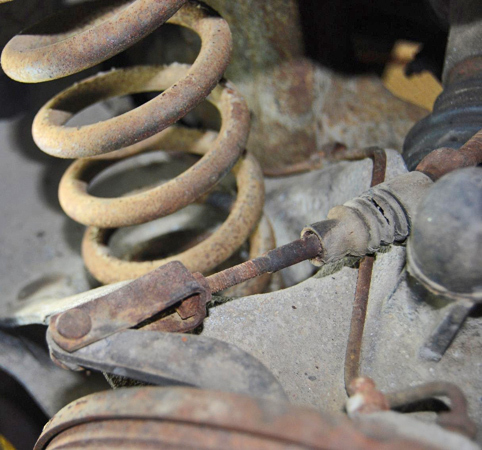 Here's how a typical old coil spring looks after the paint falls off and moisture and road grime get at the bare metal causing it to rust. 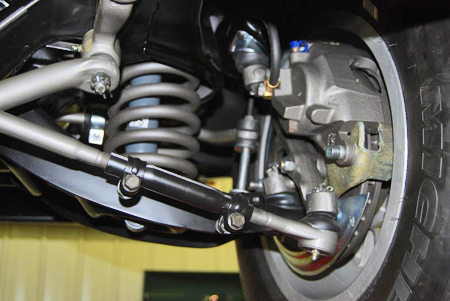 The coil spring is a part of the suspension system that is under load when compressed between the upper and lower wishbones and other suspension bits. 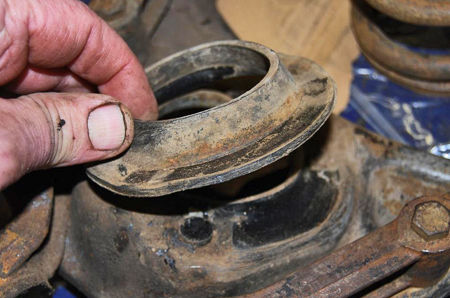 This coil spring and related parts gave been cleaned by wire brushing and could be finished with a "rust paint" if you're doing a "driver" type restoration. Rubber seats like this one are used on top and bottom of a coil spring and can sometimes be cleaned up or replaced with new ones during a restoration. 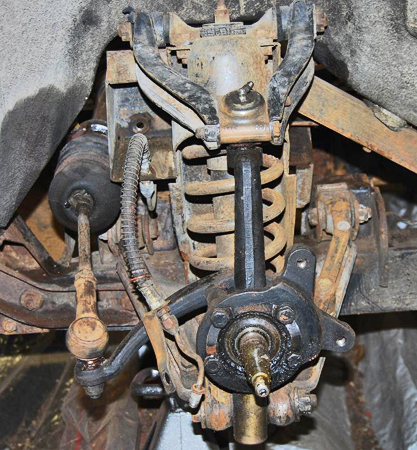 Coil spring compressors like these can be used to compress a spring for removal. Be very careful. A loose spring can become a dangerous flying object. To be honest, there wasn't much good information about this topic on the Internet. 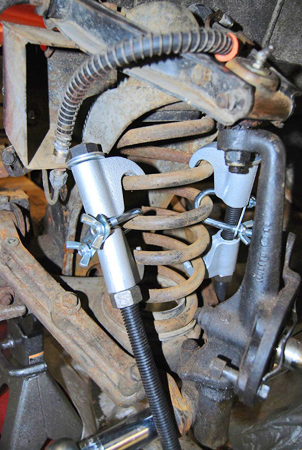 At a Website for Toyota pickup truck owners this topic was touched upon in a general discussion about whether it was OK to powder coat coil springs. Some posters said it was fine to blast springs, some said it wasn't and some admitted they just didn't know for sure. The bottom line was that some of the Toyota enthusiasts had done it and gotten away with it, but no one had any hard data or expert advice to go by. Another discussion at www.shotpeener.com included a highly technical article called "Shot Peening Techniques for Springs" written by Kumar Balan, who is a Product Engineer with Wheelabrator Group Equipment's Process Design & Specification Conformance Department. After reading this article, we still didn't know for sure if blasting would ruin a coil spring, but we formed an opinion that if the heat created during a shot peening process didn't hurt springs, blasting probably wouldn't either. But we still weren't sure. Since powder coaters blast and prime parts before powder coating them, we asked Jeff Maney at Statewide Custom Powder Coating of New London, Wis., what he thought. The Toyota Website had suggested that powder coating temperatures of 200 degrees were too low to affect the integrity of coil springs. Maney said he wasn't sure whether or not it was OK to powder coat springs. "Great topic. I'll do a full blown article on this subject for our news letter. But in the meantime, blast away. After springs are formed and heat treated, we shot blast them with steel balls .060 in diameter to 'stress relief' them. A spring that is stress relieved will last up to 10 times longer than one that is not. "We recondition many leaf springs for high end restorations and one of the very first things we do is shot peen them to clean the surfaces. This does absolutely no harm to the springs. 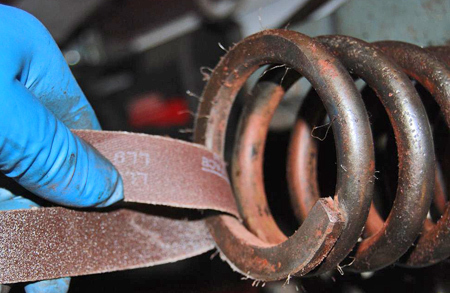 "We see problems with springs powder coated at temperatures that are too high. I addressed powder coating spring in three online articles on our Web site: www.eatonsprings.com/techquestions/powdercoatingandchromingsprings.htm and www.eatonsprings.com/powdercoating.htm. "Spring steel begins to anneal — or soften — at 400 degrees, which is well above what any media blasting cabinet can develop, but within the range of unknowledgeable powered coaters." 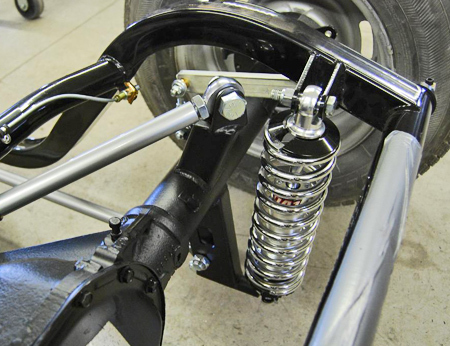 Most restorers finish their coil springs black with a rust paint such as Eastwood's Rust Encapsulator or POR 14 as seen on this Corvette chassis. Eaton said that his custom made leaf springs are shipped in bare metal , but notes that a film of metal dust is left on the surface from the shotpeening process. This film protects the surface from rust as long as the springs stay dry. 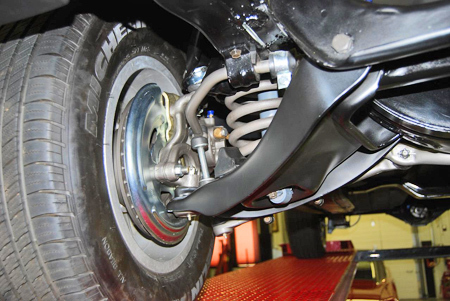 The leaf springs that Eaton manufactures in volume and all coil springs are dip coated in black paint. Eaton uses high-quality, high-temperature engine enamel. He warns that it is important to let paint dry completely between coats. He adds that springs can be powder coated as long as it's done at below 350 degrees. "Expect to spend over $100 for powder coat or $20 for paint," he says. This restorer did a beautiful job finishing his 1969 Camaro Z/28 coil springs with Eastwood's Cast Iron Gray detailing paint. 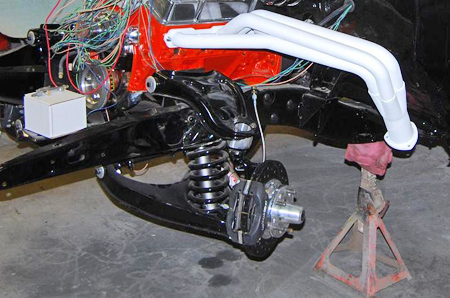 This 1969 Camaro Z/28 chassis was finished to the Nth degree during a four-year-long every-nuts-and-blots restoration. In this case paint stripper removed old flaky paint caused by years of flexing and we got the outside of the coil spring clean using a wire wheel. 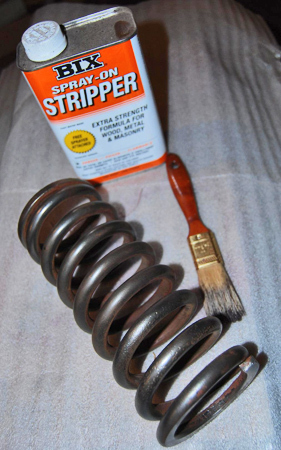 In some of our early restorations we wire brushed and sanded springs as clean as we could. Now we blast them in a media cabinet for a much better job. Chrome plating coil sprinds or even leaf springs is not a good idea unless the car is a show-only vehicle that is never driven on the road. Today, we toss the spring in our media blasting cabinet and the aluminum oxide flows everywhere and takes the old paint off all surfaces it hits. After the metal is blasted, it has a gray textured surface to we spray it with Eastwood epoxy primer to make it smooth. We wait for the epoxy to dry fuly. Then, we paint the spring with Eastwood's Best 2K Ceramic Chassis Black. Before replacing the spring in the car, we check it over and then do the install using new rubber seats (if available) and all new or reconditioned hardware.